Born 1948, and lives in Sandy Hook, Elliott County, Kentucky. 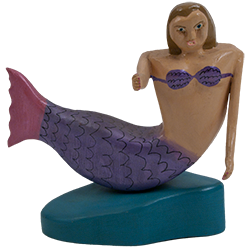 Minnie and Garland Adkins introduced us to both Jim Lewis and his self-taught folk art carvings in 1993. One Saturday, Minnie led us to where he lived where he introduced us to his wife. 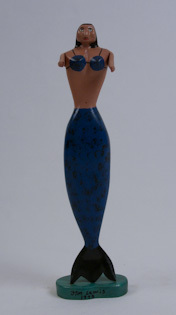 He made some "decoy" like fish and some mermaids as sculpture. We were most taken by a small cane he presented as available for sale. It was made from a sapling, the wood was not unpainted to see what the type but we imagined it to have been uprooted during a walk in the neighboring woodland. He had used the trunk of the tree as the deep sea dotted with small fish, a turtle, jelly fish and whale with "Jonah in the belly" were painted. 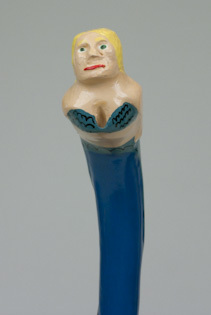 A blond mermaid was swimming out of the water to reveal her torso; as cane handle. 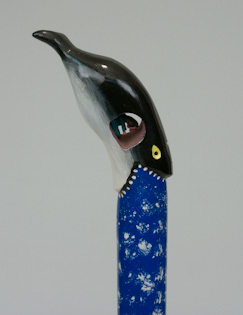 It was just one example of the fertile imagination Jim expressed then and now in his folk art. We saw him at various Folk Art fests that year and occasionally purchased work from him. We purchased another piece the following year, another cane. 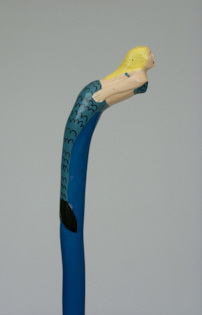 This cane was made in a similar manner but the trunk was dappled with white airy swirls of paint and the handle of the can was a carved whale. We also have a miniature carving of this story from the Old Testament. The sides of the whale were hollowed out with the exception of a small carving of Jonah trying to ride out his terrifying journey. We also purchased two mermaids and an Indian in a canoe which was sold to a friend as our friends had so often done for us. Jim worked formerly as an operator of heavy machinery but found carving to suit his personality and his chosen pace of life. His work may be found in many collections nationally and internationally. The work in our collection is from the period of 1993 and 1994. Jim Lewis's work has been exhibited in numerous shows but the 1994 curation of "Oaxaca to Appalachia" at the Folke Arte Gallery in Cleveland, Ohio seemed the ideal match. The work was from two very distinct regions of North America, Oaxaca in southern Mexico and Appalachia, notably southeastern United States. 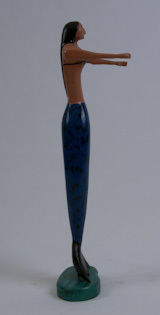 The show highlighted carving as a means for life. Strangely, the techniques, compositions, and meanings strikingly similar without similar life experiences.